This transparent yellow pigment is in my pigment spraying 52" plotter. I've used it as the water-based primary transparent yellow pigment ink since 5-11-9. The acrylic tartrazine didn't work and the opera paints pigment was ground too large and didn't work. The ink and water color paints do work well. The first important yellow found and used by artists was arsenic orpiment, it was the first transparent yellow and smells worse than the original Indian yellow. Orpiment's color is red-brown, orange-yellow and yellow. Crystals are translucent to transparent. The darkest colors will lighten to the lightest color with water. ( " " ) is a tubed color brand name or the name of a color. PY87, Diarylide Yellow 1285, Indian Yellow Org/side Transparent, Disazo CAS 15110-84-6. PY150*, "Nickel Azo Yellow", Indian Yellow Br/s, Monoazo nickel complex; Nickel Azomethine Brown/side, dual-toned. PY153*, "Nickel Azo Yellow", Indian Yellow Org/s, Dual-toned. PY173, Isoindolinone Yellow. Yellow Green/side, translucent. PY185, Isoindoline Yellow-green, Sico Fast Yellow D, translucent. PR101 + PY12*, Indian yellow by ShinHan (a great new paint manufacture of oil, acrylic and W/c paints) http://www.art-paints.com/Paints/Oil/Utrecht/Indian-Yellow/Indian-Yellow.html (and) http://art-paints.com/Paints/Watercolor/Daniel-Smith/Extra-Fine/Indian-Yellow/Indian-Yellow.html. Notice that they sell from US suppliers. I used their Indian yellow oil color and it is perfect. They make this color in oil, W/c and acrylic. They are also the best supplier of Opera magenta (I can't seem to get it yet), their best because the pigment is a smaller size than other manufactures. Orpiment was the first transparent dual-toned yellow than gamboge. Gamboge is the color of dried ear wax in its mass-tone, milked from a tree called Garcinia hanburyi. Buckthorn was another tranparent yellow lost when the Original Indian Yellow replaced them. Turmeric is another dual-toned transparent yellow and it was cheap, Original Indian Yellow replaced it because it was more permanent. NY6, Saffron, Color dye extracted from the stigmas Crocus Sativa then precipitated onto lake base. Permanent. No spaces in above reference url. NY20, Natural Yellow 20, Indian Yellow, Euxanthin; Euxanthine; Gaugoli; Monghyr; Purée of India, Extracted from urine of cows fed mango leaves which are high in vitamin C.
Calcium salts and magnesium euxanthate. Dual-toned from orange to yellow and brown to yellow in a cheaper version. Permanent. Isondolineone Azomethine Type, Irgazin 2GLT, not dual-toned, bright yellow under-tone. 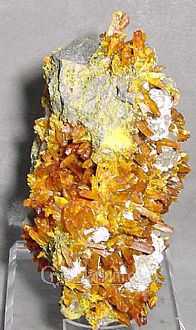 Isoindoline, "Indo Golden" is Yellow-orange mono-tone, PY139. Isondoline + Cobalt, "Cobalt Indo Golden", orange to yellow in the lightest under-tone tints only. Iron Oxide Calcined is a redish-orange masstone to yellowish-orange under-tone, translucent not a true dual-tone, PY42. 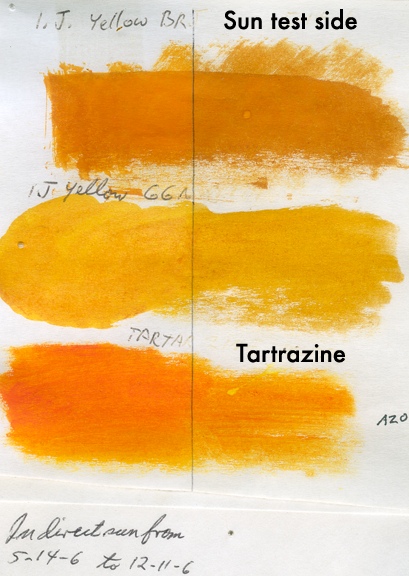 Azo Disazo Condensation, "Chromopthal 3G", yellow-orange mass-tone to yellow-yellow-orange under-tone. Mass-tone 50% Yellower mass-tone than Nickel Dioxine, Transparent, O/s, PY93. Azo Diarylide Disazo, Diarylide Yellow HR, "Indian Yellow Permanent" Indian Yellow O/s, PY83. A GOOD INDIAN YELLOW O/s. Azo Disazo, Diaryl Yellow, yellow-orange mass-tone with a red undertone, PY176. *Azo Metal Complex, "Nickel Azo Golden" PY150. THE PERFECT TRANSPARENT INDIAN YELLOW Br/s, MY CHOICE FOR EVERYDAY PAINTING. *Azo Metal Complex, "Nickel Azo", masstone from a light green-orange-brown mass-tone to an under-tone of yellow PG10. A VERY HANDY TRANSPARENT INDIAN YELLOW GREEN SIDE, they shouldn't have taken it off the market, but they did. Azo Methine, Dark, RCW#36.5 to orange+green under-tone, PG10. I don't want an unclean under-tone in exchange for a darker mass-tone. Azo Methine, Nickel Azo Dark is a green-orange, the under-tone is yellow-orange, PG10. Azo Methine, Nickel Orange is a translucent orange, the under-tone has slight yellow under-tone, PO59. Azo Methine, Nickel Orange Deep is an orange-brown to orange under-tone, PO65. Azo Methine, can go from a deeper masstone yellow-green PG10 to orange-green PG10. Azo Methine, Nickle Violet is a deep brown-red, the green has gone, magenta undertones, PR257. Azo Anthranthrone from opaque red light hue PR168 to PR177 a darker transparent red. *Azo Anthranthrone Hexterocyclic, Flaventhrone transparent PY24. PY24 is in the Indian yellow Org/s catagory. ANOTHER PERFECT INDIAN YELLOW Org/s. Azo Anthranthrone Hexterocyclic, Flaventhrone Deep transparent PY24. Loses it's dual-tone to yellow. *Azo, Tartrazine, transparent orange to yellow PY100. Permanent. Phathalocyanine Polyclic, Pthalo Dioxazine, PB15 + PV23, a cool purple. Adding more cyan makes this color more blue, dual toned Indian yellow makes a neutral dark with either color.